This is one of only three 24 hour border crossings in North Dakota and is the 3rd most heavily traveled It is also the site of the well known International Peace Garden. This crossing is also about midway along the Turtle Mountain Scenic Byway which is touted by North Dakota as a scenic road trip. If you are going to visit the Peace Garden from either side of the border you need to realize that you will need to go through a border checkpoint whether you are returning to your country of origin or continuing across the border. You must therefore have the documentation required to cross the border. 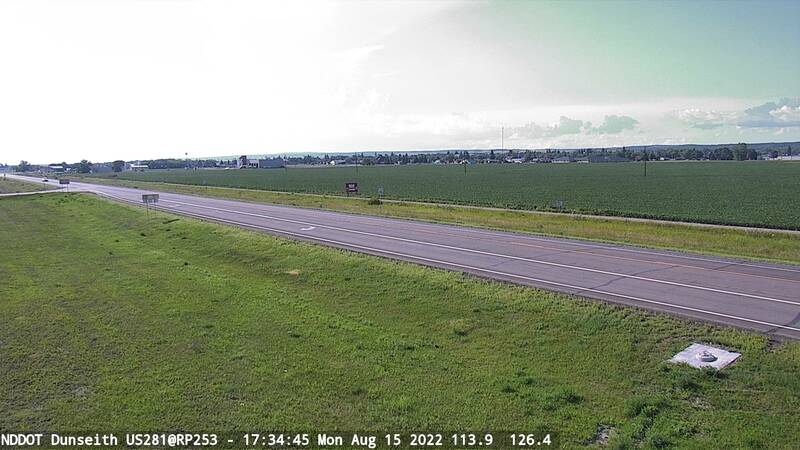 Traffic camera on Hwy 281 in Dunseith, North Dakota. the approved-travel documents is highly recommended to reduce your wait time at the border. Canadians who visit the International Peace Garden are considered to have left the country. You are therefore required to present the appropriate documentation – preferably a passport – to border officers when you return to Canada. We have special pages showing all current road advisories for the State of North Dakota and the Province of Manitoba. These pages show problems such as roadway accidents, snow or ice, lane closures or blockages, construction, road restrictions, traffic problems, and roadwork around the border crossing. Here is a handy link to hotels near Dunseith ND and here is another link to hotels nearest Boissevain Manitoba in Canada. The Peace Garden does not require any identification for entrance. However, upon leaving, you will report to the port of entry of whichever country you are entering. At that time identification will need to be presented. There is a Duty Free Shop at this border crossing. Phone 701-263-3147.